In our most recent HEMA class, I was asked for a playlist of good material. While Google and YouTube will give you an avalanche of material, the Internet is notoriously filled with garbage and it’s often difficult to know who has sound technical provenance and who is just making stuff up. What follows is my first draft playlist of material that I unashamedly mine for interpretation and occasional teaching material. There’s a lot of sound experts and instructors whose channels I haven’t touched yet, so I’m going to stick with material from people I know, or have attended lessons or who’ve taught instructors I respect. For practical HEMA classes, online lessons and recordings of seminars, anything (IMHO) by Guy Windsor and Martin Fabian has value. Dave Rawlings runs London Longsword and covers many weapons and techniques. Blood and Iron HEMA give good coverage for newcomers. The 1595 Club covers Saviolo’s fighting system including other weapons than rapier, plus Bartitsu and pugilism. I also like Il Segno’s breakdown of Saviolo’s techniques. Multi-medal winning Axel Pettersson also has a channel with really good lesson and seminar recordings. Recent discovery La Sala delle Armi introduced me to Bolognese sidesword, but cover other material very well. …and you can jump off from there to a number of channels I haven’t even touched yet. You’ll notice there’s not a lot of Society for Creative Anachronism (SCA) content from the US in my list; that’s not to say it’s no good, there’s just a lot of it and sifting the good material from the kruft takes more time than I have. There are some very good instructors in the US, I just haven’t assembled a playlist from them to beat the materials above. For wide ranging coverage of all things HEMA, historical weaponry, kit reviews, TV and movie combat reviews, Matt Easton video blogs as Scholagladitoria; dip in, and skip on to taste (“where are the f*ing shields!?”). With the video bloggers, YouTube will suggest ‘similar’ content from Skallagrim, Shadiversity, Lindybeige, Metatron and others, of variable quality (!). 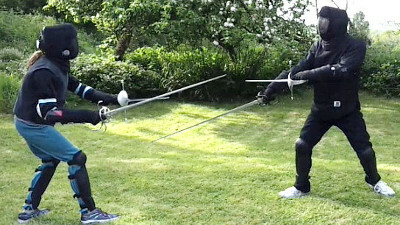 Also explore the videos from the semi’s and finals of the major HEMA competitions, such as Swordfish, Edgebana, Tyrnhaw and Norway Open; take a look at the women’s competitions as well as the men’s; I find the top women fighters spend so much time sparring with the men and overcoming the physiological disadvantages of mixed sparring, they bring noticeably better technical form.